DLRC Auctions Offers Million Dollar Collection! DLRC Auctions Realizes an Eye-Popping $230,000! 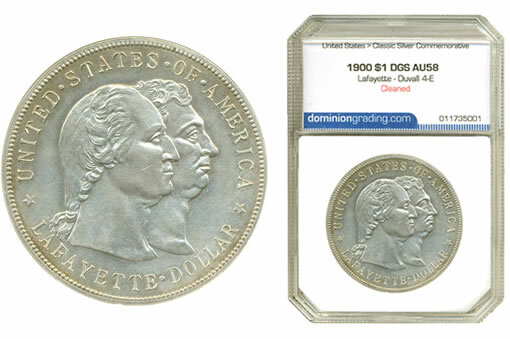 Virginia Beach, VA. DLRC Auctions is proud to offer this week the second known example of the rare Duvall 4-E variety of the Lafayette dollar. This variety was thought to be unique until the discovery of this coin, which has been graded AU58 Cleaned by Dominion Grading Service (DGS). According to John Feigenbaum, President of David Lawrence Rare Coins, the coin has "the initial appearance of a mint state coin but the luster is almost too nice and lacks the frosty surfaces of a true mint state. The coin has virtually no wear and has been very lightly cleaned to show evidence of wipe lines upon close examination in proper lighting. The only significant mark on either side of the coin is a 3 mm scratch on Washington’s cheek. Without the mishandling, this coin might have otherwise graded MS63."